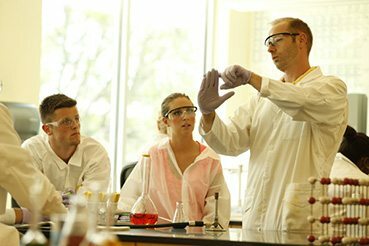 Our modern research and teaching facilities, including the Galbraith Marine Science Laboratory (GMSL), were designed primarily to acquaint undergraduates firsthand with creative learning and research experiences. In addition, the marine science program has an active fleet of vessels docked at the Waterfront Program, which allow direct and easy access to a wide variety of coastal habitats and the Gulf of Mexico. As member of the Florida Institute of Oceanography (FIO), students enrolled in the Chemical and Physical Oceanography course, spend a full day aboard one of the FIO’s oceangoing research vessel, the R/V Suncoaster or the R/V Bellows, to collect oceanographic data on Tampa Bay’s marine environments. Our modern and well equipped facilities in the Galbraith Marine Science Laboratory provide students with opportunities to work with field and laboratory equipment to study and explore the marine environment. The building houses several laboratory classrooms, aquarium rooms, a marine sediment core facility, an oceanography lab, a computer laboratory and a state-of-the-art auditorium. Our continuous flow-thru sea water system is pumped directly from Tampa Bay into our classroom and research facilities, allowing animals and algae to be maintained for extensive periods of time. Other science buildings on campus house other advanced instrumentation and equipment including a DNA sequencer, UV visible spectrophotometer, freezers, incubators, and much more. Students are able to use these instruments in their courses and projects. The Armacost Library allows students access to scientific journals and databases. Our science laboratories are equipped with Windows and Macintosh computers, which are linked to the internet and EckerdCollege intranet. Additionally, the recent purchase of several laptop computers for the marine science program allows students to record and analyze data while conducting research in the lab. 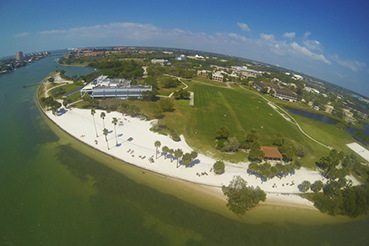 Our campus is situated on Tampa Bay, allowing us to access an extraordinary diversity of marine and estuarine species in a wide variety of coastal habitats including sea grass beds, sand flats, beaches and mangroves. This diversity of coastal habitats is easily accessible by our active fleet of vessels, which include three offshore powerboats, a beachcat with a working deck, and the US R/V Gilbert. Eckerd College Marine Science 2 is a 24′ Cape Horn Power Boat used to conduct diving research, specimen collection and lab sessions. This vessel is equipped with a 150 hp Mercury outboard, 2 bottom finders, VHF radio. DGPS (differentially corrected GPS) and swim platform. This vessel is used as an outdoor classroom/lab under faculty supervision. Eckerd College Marine Science 3 is a 19′ OffShore Power Boat, used in dolphin and water quality research or anything requiring a shallow water boat. Equipped with a 115 hp Mercury outboard, VHF radio, bottom finder and DGPS, this boat can be reserved for research purposes. Marine Science 4 is a 18’ Cape Horn center console vessel that is used in dolphin research. The Eckerd College Dolphin Project (ECDP) began in 1993 to meet several objectives. They include scientific research on bottlenose dolphin biology in the Boca Ciega Bay area, to provide a platform for students to learn first-hand about dolphins and dolphin research, and to provide information to conserve dolphins and other resources in the area. Since 1993, 452 boat based surveys have been conducted in Boca Ciega Bay and surrounding waters and photographs collected during these surveys have resulted in a catalog of 673 individual dolphins. The Beachcat is a 32’ x 12’ catamaran that features an open “working deck”. It is powered by twin 200HP Mercury outboard engines. It can easily seat 30+ passengers and travel at speeds up to 25 knots. The vessel is primarily used to support the Marine Science program at Eckerd College and it’s numerous on-the-water laboratories. The R/V G.K. GILBERT is a 50-ft aluminum semi-V-hulled Munson Hammerhead built in 1993. Powered by three 6V92 turbo-diesels coupled to Hamilton Jets, it can make 34 knots. The shallow draft of 2.5 ft and quiet jets permit seismic surveys to be performed in shallow water with little noise interference. It is equipped with 2 generators that provide 25 kilowatts of clean, 220 volt, 3-phase power to operate equipment, instruments, and computers. The vibracorer consists of a pneumatically actuated, reciprocating head mounted on a cart that slides down a 22-ft stayed-aluminum mast attached to a 400-lb rectangular, steel-channel, base-frame. Two 7 hp electric compressors produce 70 scfm of air at 70 psi to drive a 0-ft-long by 3-in.-diameter aluminum core barrel (clamped to the bottom of the head) into the sediment. A check-ball valve and core catcher assure recovery of samples during extraction from the seabed by the vessel’s 6-ton Hiab Sea-Crane. In four years of operation, over 500 cores have been taken from South Carolina to Texas in water depths ranging from 0 to 120 ft. (To accommodate the 0-ft depth, the vibracorer was set on the bank of a bayou in Louisiana to core marsh sediments while the R/V GILBERT floated alongside in 3 ft of water). The R/V Gilbert belongs to the US Geological Survey and is kept at Eckerd’s waterfront as part of an ongoing co-op research program. The marine science research vessels are harbored at the campus waterfront area. Our subtropical climate allows us to employ field work and boat use in our classes year-round. The R/V SUNCOASTER is a 105-ft research vessel, built in 1962, is owned and operated by the Florida Institute of Oceanography on behalf of the State of Florida and the State University System. It is designated and certified as an Oceanographic Research Vessel by the US Coast Guard and is inspected by NOAA Fleet Operations. The normal operational areas for the SUNCOASTER are the Gulf of Mexico, SE Atlantic, Bahamas and the Caribbean Sea, however the SUNCOASTER has operated as far north as Maine in submersible operations. Research disciplines supported are Biological, Physical, Seismic, Geological, Environmental and Weather. There are 420 square foot of air conditioned wet/dry laboratories with scientific freezer space; 600 square foot afterdeck area without the crane mounted; Additional storage for scientific equipment on the 01 deck. Side boom-Port location, extends 12 ft. for plankton/neuston tows, installed on request. Crane-5 ton Hiab articulated boom crane can be installed on the aft deck with advanced notice. The R/V BELLOWS is a 71-ft research vessel, built in 1962, owned and operated by the Florida Institute of Oceanography. Powered by two GM6-71 diesel engines for 400 total hp and with a shallow draft of 4 ft it is ideal for estuarine, coastal, Caribbean and BahamasIsland research. The normal operational areas for the BELLOWS are the Gulf of Mexico, SE Atlantic, Bahamas and the northern Caribbean Sea. Scientific equipment that is available for use on cruises include: CTD, XBT, Niskin bottles, reversing thermometers, bottom grabs, and piston corer. Side boom-Starboard side extending 13 ft for plankton/neuston tows. Work area-185 sq. ft. dry/wet air conditioned 12′ x 14′ laboratory, refrigerator/freezer space; salt water system; 275 sq. ft. afterdeck area. 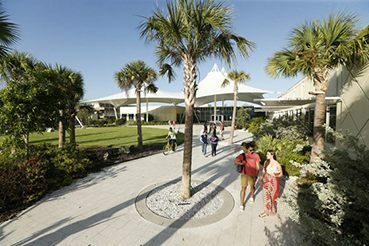 Eckerd College Waterfront Program provides dockside facilities to harbor the marine science vessels. Located on Frenchman’s Creek, facilities include the Wallace Boathouse, an Activities Center, multiple docks and a boat ramp. In addition to the marine science vessels, canoes, sea kayaks, and snorkel equipment are readily available and regularly used in marine science courses.